Clara Langhorne Clemens Samossoud, formerly Clara Langhorne Clemens Gabrilowitsch (June 8, 1874 – November 19, 1962), was a daughter of Samuel Clemens, who wrote as Mark Twain. She was a contralto concert singer and, as her father's only surviving child, managed his estate and guarded his legacy after his death. She was married twice—first to Ossip Gabrilowitsch, then (after Gabrilowitsch's death) to Jacques Samossoud. She wrote biographies of Gabrilowitsch and of her father. In her later life she became a Christian Scientist. Clara was the second of three daughters born to Samuel Clemens and his wife Olivia Langdon Clemens in Elmira, New York. Her older sister, Susy, died when Clara was 22. Her only brother, Langdon, died as an infant before she was born. Her younger sister was Jean. Clara had a serious accident as a child while riding a toboggan. She was hurled into a great oak tree, resulting in a severe leg injury that almost led to amputation. Twain with his daughter Clara and her friend. She spent the period from September 1897 to May 1899 living in Vienna with her parents. While there, she cultivated her voice for the purpose of going on the concert stage. Her voice was characterized as unusually sweet and attractive. She also studied piano in 1899 under Theodor Leschetizky, who had been a pupil of Carl Czerny. In December 1900, she was invited by the people of Hartford to perform at a grand concert given by the Boston Symphony Orchestra. She studied for several years under masters in Europe, before making her professional debut in Florence. Her American debut, assisted by violinist Marie Nichols, as a contralto concert singer was on the evening of September 22, 1906 at the Norfolk Gymnasium. in Norfolk, Connecticut where in 1905 she rented Edgewood, Clemens used the proceeds from the concert to purchase a memorial window for her mother in the Norfolk Church of the Transfiguration, Episcopal. Charles Edmund "Will" Wark (1876-1954), a classical pianist originally from Cobourg, Ontario, Canada, became Clemens' piano accompanist from the winter of 1906 to late in 1908. Clemens and Nichols also continued to perform together, including a series of concerts in London and Paris in 1908. On May 30, Clemens debuted in London at a benefit concert, raising money for American girls to attend Oxford and Cambridge Universities. At 10:00am on December 20, 1908, Clemens went for a sleigh ride with Russian concert pianist Ossip Gabrilowitsch, who was staying with her father at his residence, Innocence at Home, in Redding. The horse was spooked by a flapping newspaper and bolted, causing driver Gabrilowitsch to lose control. At the top of a hill, near a 50-foot (15 m) drop, the sleigh overturned, throwing Clemens out. Gabrilowitsch saved both Clemens and the horse from plunging over the edge, spraining an ankle from his exertions. He returned Clemens to home, unharmed except for the shock of the accident. Twain biographer Michael Shelden doubted the truth of this heroic tale and supplied a motive for why the story might have been planted in the press, namely, to quiet rumors that Clara was having an affair with Charles E. Wark, her former accompanist, a married man. Clemens had been introduced to Gabrilowitsch in 1899 in Vienna by Theodor Leschetizky, who was also training Gabrilowitsch. 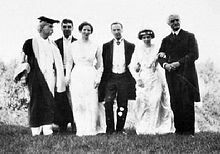 At noon on October 6, 1909, she married Gabrilowitsch in the drawing room at Stormfield, the Clemens home, with her father's friend, Rev. Dr. Joseph H. Twitchell, presiding.) Her father said that the engagement was not new, having been "made and dissolved twice six years ago." He also said that the marriage was sudden because Gabrilowitsch had just recovered from a surgical operation he had undergone in the summer and they were about to head off to their new house in Berlin where he would begin his European season. 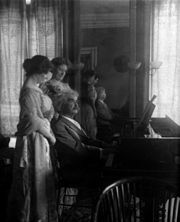 On April 21, 1910, Samuel Clemens died, having left his estate to be equally divided by his surviving daughters in a will dated August 17, 1909. His daughter Jean Clemens had drowned in the bathtub on December 24, 1909 after having an epileptic seizure. Thus Clara inherited the entire estate, which provided for quarterly payments of interest to keep it "free from any control or interference from any husband she may have." On July 9, Clara announced that she was giving nearly the entire library of her father, comprising nearly 2,500 books, to the Mark Twain Free Library. On August 19, 1910, Clara's only child, Nina, was born at Stormfield. Nina Gabrilowitsch (1910–1966), the last known lineal descendant of Mark Twain, died January 16, 1966 in a Los Angeles hotel. She had been a heavy drinker, and bottles of pills and alcohol were found in her room. On April 23, 1926, Clara played the title role in a dramatization of Joan of Arc written by her father at Walter Hampden's Broadway theater. This adaptation and her performance were not very well received by critics. It was again produced in 1927, opening on April 12, for a series of special morning and afternoon performances at the Edyth Totten Theatre. Gabrilowitsch was conductor of the Detroit Symphony Orchestra from 1918 until 1935, when he fell ill. He entered the Henry Ford Hospital on March 25, 1935, where he stayed until he was released to his home to convalesce on September 28, 1935. He died at home on September 14, 1936, aged 58. On May 11, 1944, Clara and Jacques Samossoud, a Russian-born symphony conductor 20 years her junior, were married in her Hollywood home. After exploring eastern religions for several years, Clara embraced Christian Science, although there is some question as to her seriousness and commitment to it. She authored a book on the subject: Awake to a Perfect Day, published by Citadel Press, NYC, 1956. She also published biographies of both her father (My Father, Mark Twain in 1931) and of her first husband (My Husband: Gabrilowitsch in 1938). Although in 1939 Clara objected to the release of her father's Letters from the Earth, she changed her stance and allowed them to be published shortly before her death on November 20, 1962. ^ Smith, Harriet Elinor, ed. (2010). Autobiography of Mark Twain: Volume 1. University of California Press. p. 480. ISBN 978-0-520-26719-0. ^ The house was later renamed "Stormfield." "Mark Twain on 'Innocence at Home,' Grover Cleveland, and God," Shapell Manuscript Foundation, n.d. Retrieved 12 June 2018. Trombley, Laura Skandera (2010), Mark Twain's Other Women: The Hidden Story of His Final Years This book includes new details regarding a romantic connection between Clara Clemens and her piano accompanist, Charles E. "Will" Wark (a married man), also the impact this illicit romantic relationship had on her father, Samuel Clemens and how it eventually fostered Clara Clemen's relationship with Ossip Gabrilowitz. Wikimedia Commons has media related to Clara Clemens.